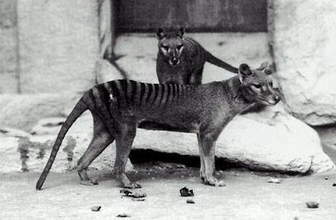 Tasmanian tigers were officially declared extinct seventy years ago. In what appears to be a first, DNA from an extinct animal has been re-activated "Jurassic Park-style" in the laboratory. Scientists from Australian and U.S. universities were able to extract a gene from a preserved specimen and then insert it into mouse embryos where it altered cartilage and bone development - demonstrating its viability. Dr Andrew Pask, from the University of Melbourne in Australia, who led the research, said: "This is the first time that DNA from an extinct species has been used to induce a functional response in another living organism. As more and more species of animals become extinct, we are continuing to lose critical knowledge of gene function and their potential." SF fans keep hoping for sightings of extinct animals; see Spider Blood In Amber Brings Jurassic Park Closer and 'Pleistocene Park' For Woolly Mammoths? for specifics. Via Independent; thanks to Moira for contributing a tip (you can, too! see the link below).